- In fierce hand-to-hand fighting, the French 70th Division seizes the cemetery at the village of Ablain, west of Souchez in Artois, and the connecting German trenches. - Early in 1915 the French had decided to embark on a campaign of strategic bombing that aimed to impair German industrial production. 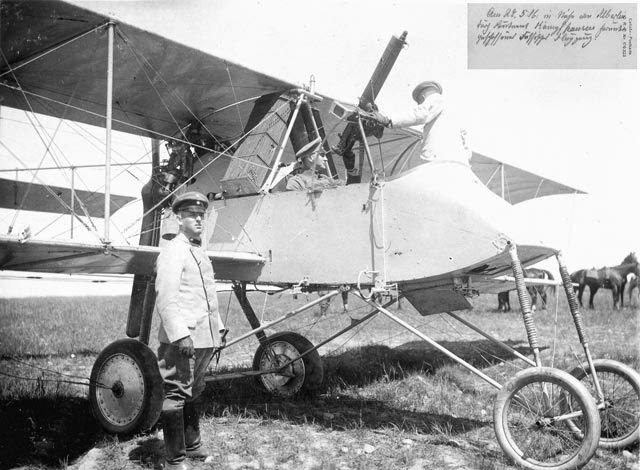 The first bomber group, GB1, was equipped with the reliable Voisin III aircraft, which was specially-equipped with bomb racks that carried 155mm artillery shells. After training for several months, GB1 undertakes its first mission today. Their target is the Badische Anilin Company of Ludwigshafen. The raid is a moderate success, with all but one of the aircraft returning safely to base. Unfortunately, it was the squadron commander's plane that crash-landed, and he will spend the rest of the war in a POW camp. The French Voisin III bomber. - Mackensen's orders for the ongoing German offensive in Galicia emphasize the importance of the advance of XXXXI Reserve Corps. On the southern flank of 11th Army, the corps is to advance towards the Medyka-Mosciska road, the seizure of which would sever the main Russian communication and supply link to Przemsyl, while the objectives of the rest of the army are more limited. The attacks of XXXXI Corps, however, encounter heavy Russian resistance; only in the afternoon is 81st Reserve Division able to capture the town of Stubno. Meanwhile, as the German 11th Army has advanced eastward to and across the San River, its connection with the Austro-Hungarian 4th Army to the north has necessarily stretched, with the latter forced to hold a greater length of the line. The result has been the commitment of most of 4th Army's reserves to the front line to maintain a cohesive front, leaving insufficient forces available in the event of a Russian counterattack. Overnight, this is precisely what happens: the Russian III Caucasian Corps launches an attack east of Sieniawa. The initial blow falls against the Austro-Hungarian 36th Infantry Regiment, which promptly disintegrates, and 10th Division falls back across the San River in disorder. Because of a lack of Austro-Hungarian reserves, the Germans are forced to send 19th Division from the neighbouring 11th Army to the rescue. Though the Russian attack soon bogs down and fails to cross the San, its initial success has succeeded in forcing the Germans to dispatch reinforcements that otherwise was to have contributed to Mackensen's ongoing offensive. On the Russian side, General Ivanov of South-West Front has wavered over whether his armies should hold Przemysl, or retreat further to the east. On three occasions since the 25th he has issued orders to abandon the fortress, only to countermand them within hours. 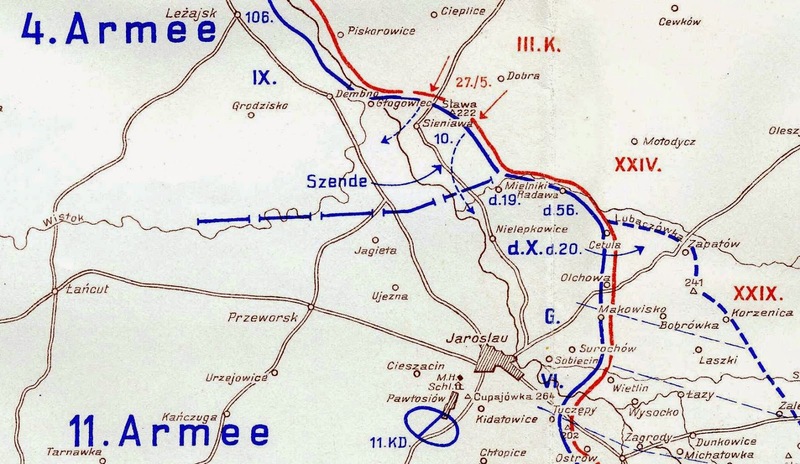 Today Russian army headquarters intervenes, instructing that Przemysl is to be held. To facilitate this, the corps on the northern flank of Przemysl, formerly of 3rd Army, are transferred to 8th Army, so that one commander - General Brusilov - can direct all of the forces at and around the fortress. In an effort to hold Przemysl, he begins shifting divisions from the southern flank of the fortress, where the Austro-Hungarian 3rd and 2nd Armies have been largely ineffective, to the northern flank to oppose the ongoing advance of the German 11th Army. The Russian attack at Sieniawa, just north of the offensive of the German 11th Army, May 27th, 1915. - The German submarine U21 claims a second victim off Gallipoli when it torpedoes the British pre-dreadnought Majestic at 640am this morning. As it sinks it rolls over and comes to rest in shallow water near Sedd el Bahr. Its keel remains visible above the surface, a stark reminder that the waters off the Dardanelles are now contested. The British pre-dreadnought Majestic sinking off Gallipoli, May 27th, 1915. - Today the Ottoman cabinet approves The Provisional Law Concerning the Measures to be Taken by the Military Authorities Against Those Who Oppose the Operations of the Government During Wartime, which provides the legal basis for the ongoing deportation and mass murder of the Armenian population. It gives army and local officials sweeping power to take whatever means they deem necessary to deal with any real or perceived opposition to the persecution of the war, and in particular authorized the forced relocation of entires towns and villages 'in response to military needs, or in response to any signs of treachery and betrayal.' The ongoing paranoia of the Young Turk leadership combined with the catalogue of battlefield defeats ensures that Ottoman officials see 'signs' of resistance everywhere - indeed, if the Ottomans are doing poorly someone must be to blame, and that group must be purged from Ottoman society. This is to be the fate of the Armenian population in particular, and though massacres predated the law, the pace of extermination will accelerate afterward its proclamation.